Tha Lane Bay, Krabi, Thailand – travelographie. 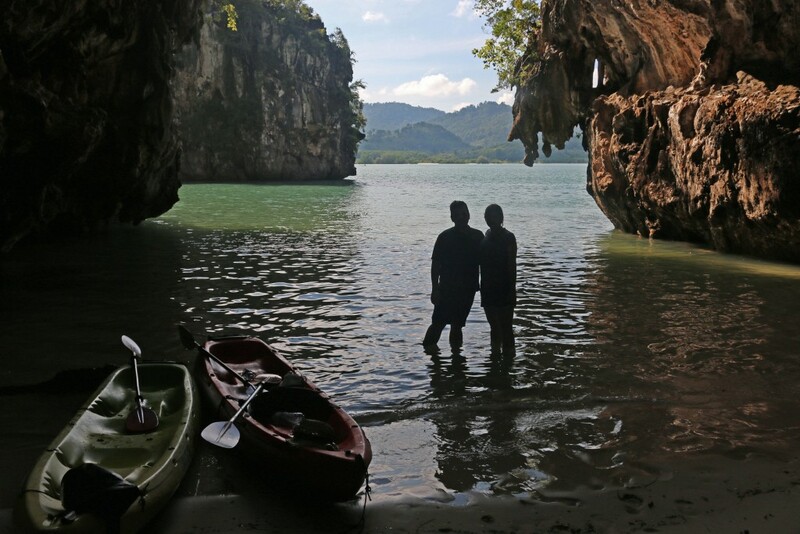 This was one of the best things I did in Thailand: kayaking through the unnamed mangroves on Tha Lane Bay in the Krabi region on Christmas morning. We hopped into kayaks at the Tha Lane pier and pushed off from a dock filled with long tailed boats lolling in the waves. Our Thai guide, Him, led us across the bay and we glided along the coast, where limestone crags jutted up straight from the sea. A brocade of rainforest green cloaked the coastal crags and the mountains of the mainland, just beyond the mangroves. Navigating through a slit between two crags, we entered into a grove almost enclosed by the rock formations, and pulled onto the beach. 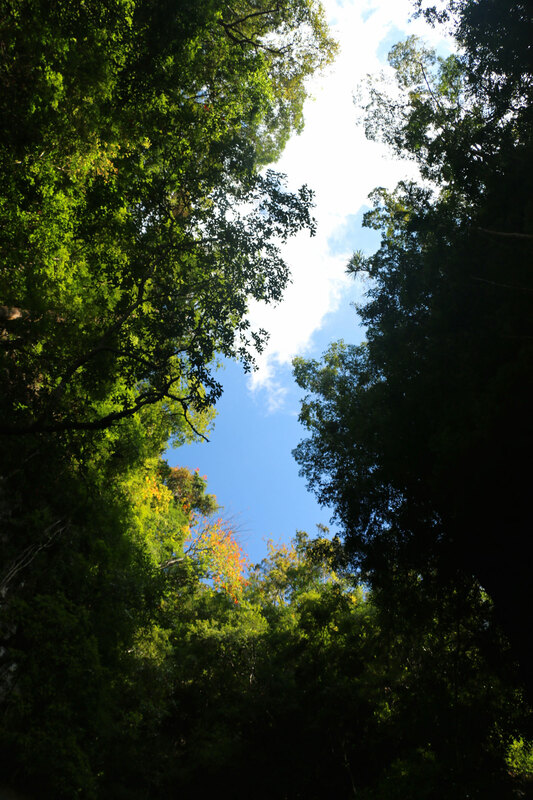 The jungle canopy above covered everything but a speck of sky, impossibly blue. Looking out into the bay from the darkened strand, we squinted at the sun scattering on the turquoise sea. Him waited patiently for us on the beach. Even though I know it’s not true, it feels like we were the first people to have found this place. 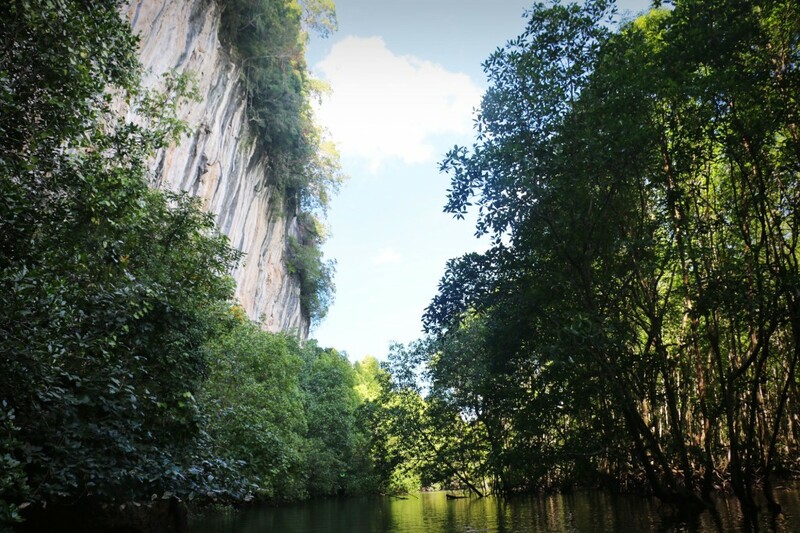 Next, we navigated our kayaks into the mangrove, passing through two imposing rocks flanking the entrance to the swamp. The scale of nature here—dwarfed by the soaring stones and swallowed up by the jungle—made me feel we were entering a place where we were not entirely supposed to be. It was beautiful, but there was something unsettling about the mangrove for me. Hovering above the water, the jungle gathered in a tight weave of single trees, the bald roots gnashing together menacingly. An army of witch’s brooms skimming a cross the swampy surface. 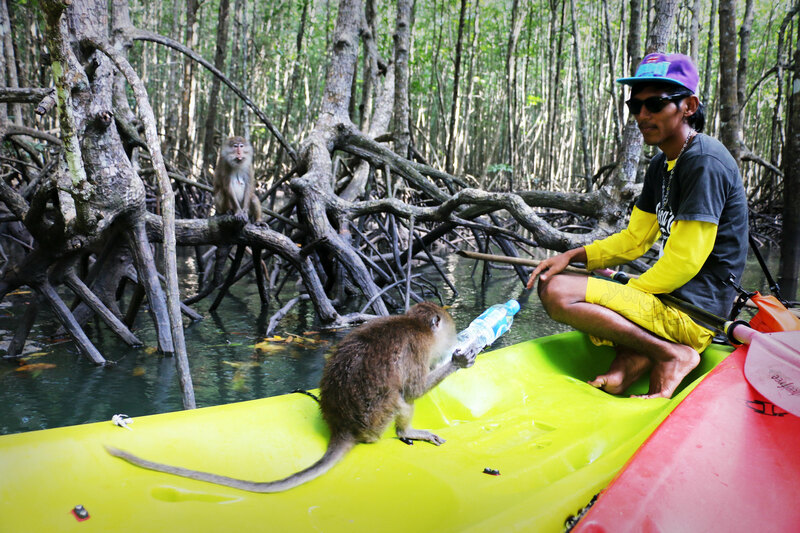 As we paddled through the mangrove, ducking under branches and trees, we seemed to be making up the way as we went. It was maze, and if we were to turn back, we might catch the trees in the act of hastily weaving their roots into a curtain and drawing it across the channel to block the way out. But there was no monster at the end of this maze, only below: swimming snakes, alligators lying in wait, and other dangerous beasts. Our guide pointed to a black cobra clinging to a cliff, dangling there like a root. Following a trail of leaves fluttering down to the water, we spotted gibbons swinging in the trees growing out of the cliffside, keeping their distance. We also spied a family of macaques paddling furiously across the channel—their speed suggested that they also knew the water is unsafe. Once they saw our kayaks, they jumped onboard and padded over our outstretched legs in search of water. 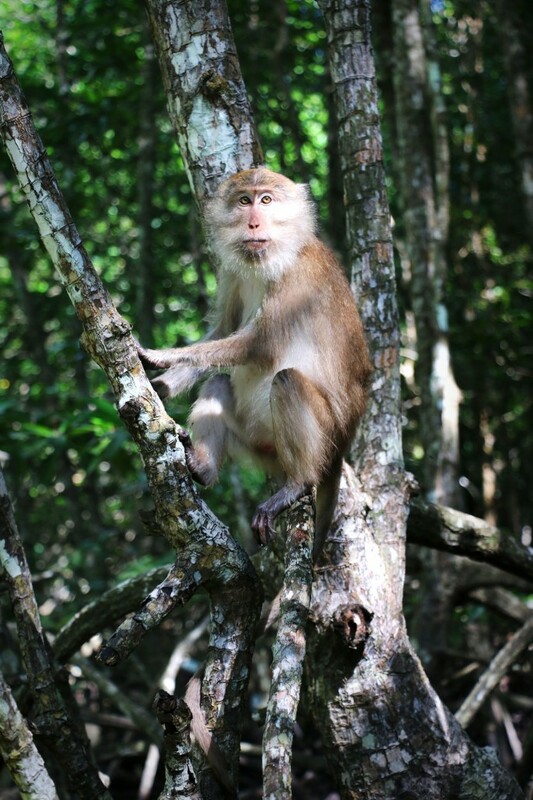 The marauding monkeys grabbed our water bottles and sunk their teeth in for a drink of fresh water. 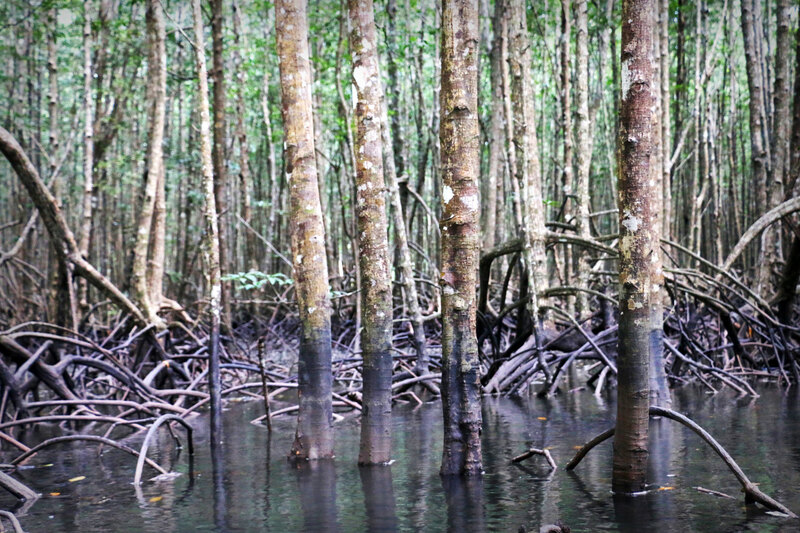 Even though we were surrounded by water here, the water is brackish, and the mangrove is actually a kind of desert. The monkeys were very thirsty. As we were paddling our way through the maze, I couldn’t help but be drawn deeper in by this place’s inherent sense of danger and unease, but also its beauty and peace. The mangrove is an amphibious purgatory between land and sea, a liminal, nowhere place that can never belongs to either, which is precisely that which makes it loom so large. We have a hard time with these kinds of in-between places. And the mangrove is in constant flux. If we came back tomorrow, the channels might be overgrown with new trees sprouting up overnight from the mud. Later today even, the tide might come and flood our way out with water, trapping us in the low-lying canopy of branches. Or it might ebb out to sea, stranding us in the slime. The “sea gypsies” of the Andaman Sea, the native nomadic Austronesians of this region, must have understood this. They used the mangrove not for everyday living, but for the two poles of life: veneration and burial. Though the “sea gypsies” are long gone, as our guide told us, their mark remains on the stone faces of the cliffs that enclose the quagmire, inscribed with religious offerings. Some of the caves were used as final resting places for their dead. Christians may send their prayers towards the heavens, but they lay their dead to rest in the opposite direction. The sea gypsies placed their dead somewhere between the two worlds, but still on the plane of human existence. Not gone somewhere unfathomable above or below, just apart. 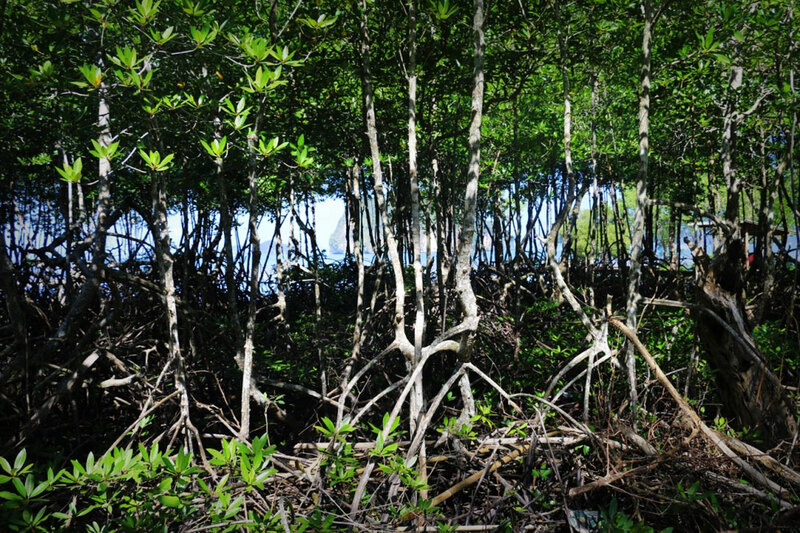 The mangrove is also there to protect, and the dense, stubborn world keeps out humans and the sea alike. It was Christmas Day 2015, and it was nearly 11 years ago to the day that the tsunami hit here. The ocean rose up, tame for so long that no one remembered it was actually wild. Where the mangroves still stood—places where beaches hadn’t been artificially created for tourists or cleared for agriculture—the damage was minimal. The mangroves actually absorbed the force of wave like a watertight lock, protecting the land behind it. After hours of paddling, we took a turn and suddenly we were back, gliding into the aqua bay that opened up onto the ocean. I had no idea how we got back, and I knew I could never retrace our course. After hours sheltered in the dusky tunnels of the mangrove, the sky and sea overwhelmed. I thought, or remembered, that the ocean is captivating, at least in part, because it so endless. Terrifying even. 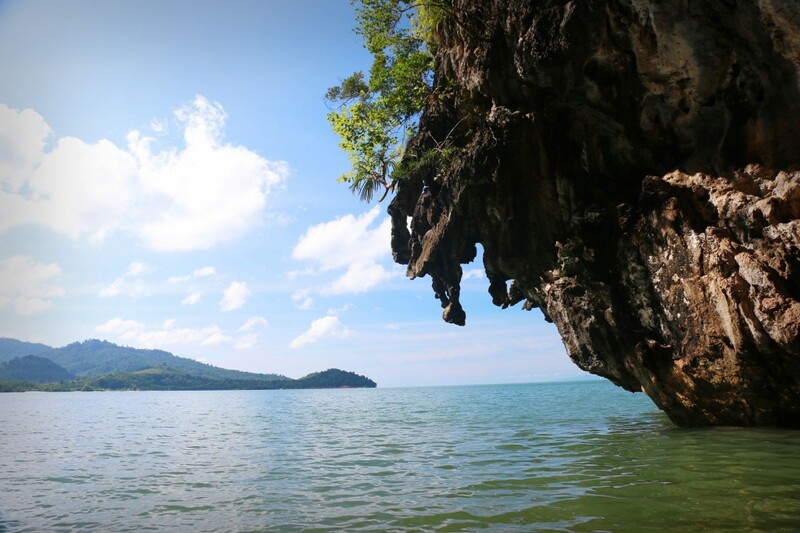 In a place like Thailand, it’s easy to forget this about the sea, where the waters are so warm and welcoming. But the fact remains.